PTE RICHARD H ARROL 5TH S.H. Richard Hubbard Arroll was born on 18th February 1879 at 19 Gardner Street, Glasgow, the third of a family of six born to Richard Hubbard Arroll, from Helensburgh, Dunbartonshire and Annie Walker McLay, from Glasgow, who had married in Glasgow on 19th June 1874. Richard senior was originally a housepainter but later became a landscape artist and exhibited in Paris. 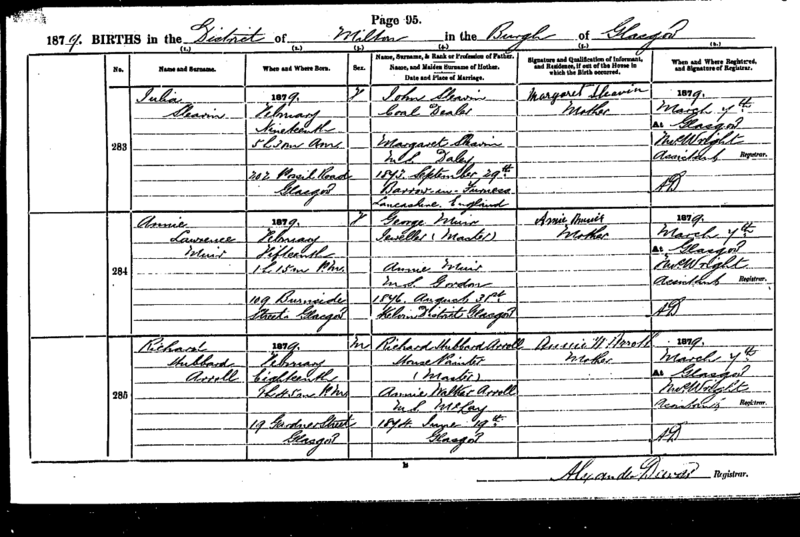 In 1881 Richard (28), Anne (30), and three of their children Mary, Richard and Ellen were living in Partick, Glasgow. Another son, Walter, was staying that night with grandparents in Helensburgh. Richard's business employed 7 men, 2 boys and a girl. In 1891 the Arroll family was at 14 Wilson Street, Partick. Mary (15) was a milliner. The family employed a general servant, 17 year old Christina McDonald from South Uist. Richard junior was at school. In 1901 the Arroll family was still living in Wilson Street, Partick at No 18 (possibly a re-numbering of No. 14). By then Mary was a schoolteacher, Walter a law student, and Richard junior (22) was a decorator. Richard Hubbard Arroll junior married Annie Bilsland White, daughter of James White, a commercial traveller, and Annie Bilsland, 11 Holyrood Crescent, Glasgow in the Windsor Hotel, Glasgow on 12th June 1906. In 1911, Richard (32), Annie B (25), and their daughters Annie M (2) and Maymie H (1) were living in Beaumaris, a 6-roomed house in Torr Road, Bridge of Weir. Richard was a master painter, and they employed a domestic servant Annie M Reid (19). The girls were both born in Glasgow suggesting they had moved to Bridge of Weir within the previous year. A third daughter, Jane, was born in 1913. Richard Arroll attested under the "Derby" voluntary registration scheme on 1st December 1915, before the Military Service Act of 2nd March 1916 introduced conscription of single men between the ages of 18 and 41. An attraction of the Derby scheme to married men was that a promise was given that they would not be called up until the supply of single men had been exhausted. But conscription was extended to married men in May 1916 and Richard was mobilised on 21st June 1916 into the 3/5th Seaforth Highlanders, regimental number 5072. He was 37 years old and father of three girls of 3, 6 and 7. He served as acting Lance Corporal during his training, but had reverted to Private when he was posted to the British Expeditionary Force between 23rd December 1916 and 28th May 1917. The 5th Battalion formed part of 152nd Brigade in the 51st (Highland) Division which fought in the Arras offensive, notably the First and Second Battles of the Scarpe in April 1917, and in the capture and defence of Roeux on 13/17th May 1917. 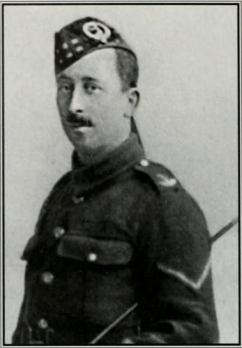 Richard was wounded in the perineum and right thigh on 15th May, repatriated to the Military Hospital in Hampstead but died of complications on 24th August 1917, leaving a widow, Annie, and three young daughters, who were by then living in Byres Road, Glasgow. Wasted Journey, The Buddies who never came back. Paisley Library. 940.467; PC17430: O/S. 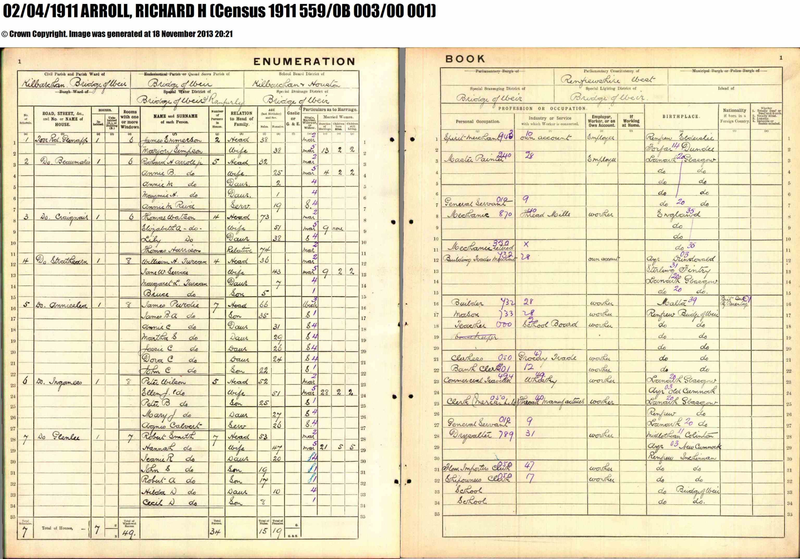 1911 UK Census: Parish: Kilbarchan & Bridge of Weir. Ward: Bridge of Weir; Page 1; lines 3-7. 559/0B 003/00 001. ANNIE MARGARET ARROLL, b 23 Aug 1908 at 494 Great Western Road, Glasgow. ANNIE was a textile designer. She m 31 Mar 1945 to Arthur Robert Hughes at George Square, Congregational Church. Robert, a wages and shipping clerk, was the son of Arthur John Hughes, a braid manufacturer, and Alice Gertrude Platts. ANNIE was living at 55 Ashton Road and Arthur was also living at 55 Ashton Road when they married. In 1955 they lived at 11 Russell Road, Buckhurst Hill, Essex. ANNIE d 20 Jul 1987 at Dalbeattie of cardiac arrest. MAYMIE HUBBARD ARROLL, b 26 May 1910 at 494 Great Western Road, Glasgow and d circa 1980. JANE EILEEN ARROLL, b 27 Jun 1913 and m on 19 Aug 1940 to Robert Alexander Macaskill of Gourock, Scotland. JANE EILEEN was trained as a mechanic during WW II. She worked for Addressograph Multilith as a demonstrator. Her husband, Robert, died from wounds received during WW II. Robert was a wireless operator. Lance Corporal, Royal Corps of Signals when they married. He lived at 47 Glock Road, Cournagh. He was b circa 1917, the son of Alexander Macaskill, a lighthouse keeper, and Christina Macleod. In 1987 JANE lived in Dalbeattie, Kircudbrightshire. The War Diary of the 5th Seaforth Highlanders, 51st (Highland) Division. D Sutherland. John Lane. 1920. pp113-116. On 11th May, however, we were back in the same battle area, east of Fampoux. Here our front line was to the west of Roeux cemetery, the Division which had succeeded ours having in the interval lost the greater part of the village. One of the first things the battalion did on taking over, was to push forward on the night of the 13th and occupy the eastern end of Roeux, at the same time establishing posts on the Roeux-Plouvain road. We retook this area with scarcely any casualties, although the Boche snipers, hidden in the houses, caused some trouble, until our men, entering the houses on the opposite side of the street, replied by counter-sniping, and by this means, and rifle grenades, they soon wiped them out. For a day peace reigned supreme, and every one began to wonder what the Boche was doing, especially as some prisoners had said that he was to retire to his next line. Then suddenly the enemy's guns opened out, not only his batteries on our front, but also his guns on right and left, directing a converging fire on our narrow front (approximately three-quarters of a mile), for he seemed to have a great desire to get back what he had lost. Towards early morning his fire became heavier and heavier, until it reached its maximum, when he was giving us as heavy a shelling as we have ever given him. Immediately afterwards he advanced with tens of thousands of fresh troops brought up from the rear, and those were hurled over the front. The Chemical Works again became the centre of the storm, and with such fury did he attack that the right battalion of the Division on our left was hurled back, and our men had for a time Boche in front, on their left flank, and behind them. Our men were fighting stubbornly against tremendous odds, and yet they resisted all his attempts at taking their line. Colonels, Majors, and even tunnellers were fighting for all they were worth, one Colonel accounting for several Boches with a rifle he picked up. Reports came filtering back by wounded, that we had lost the position - a rumour which proved to be untrue, but caused some anxiety, as all our telephone lines forward had been smashed to pieces by the intense fire, and no reliable information was available for some time. Battalions in support and reserve were hurriedly moved forward, and one of these, coming up at the double with fixed bayonets, charged the Boche and hurled him back in confusion. He could no more stand against our cold steel that a sparrow can stand against a hawk, and he was soon back in his own lines broken and disorganised. In this battle 2nd Lieut. A.J. Mackay who won the M.C. at Beaumont-Hamel was awarded a bar; for when cut off in Roeux, he organized defensive posts, and held his position, inflicting heavy losses on the advancing enemy. He then led a counter-attack and drove them back. 2nd Lieut. Donald Simpson, for his bravery in the same fight, won the M.C. Although severely wounded in the morning, he refused to leave his men and go to the dressing-station, and continued doing splendid work all day. Sergts. A. Morrison, James Mowat, and J. Shaw Kelly also won D.C.M. 's for the exceptionally gallant work they did in helping to save what was an extremely critical situation. Our men say that it was the finest chance that they have had in this war of meeting the enemy face to face, and I think those Huns who survived will remember it ruefully for the rest of their lives. For once also we had a chance of using rifle fire as it should be used, as he came over in rather close formation, and thousands upon thousands were mowed down, as a scythe mows down a hayfield, by our machine guns and rapid rifle fire. Congratulatory wires were afterwards received fron the Army and Corps Commanders. The Army Commander's wire said, "Convey to 51st Division my congratulations on their gallantry at Roeux and Chemical Works on 16th May." while the Corps Commander wired, "Heartiest congratulations to you all on fine work of 15th and 16th, and especially to General Pelham Burn and 152nd Inf. Bde. whose tenacity and pluck saved an awkward situation. The Division may well be proud of its latest achievement." On the 17th the battalion was relieved and found its losses consisted of 2 officers, Lieuts. J. Eadie and D. Simpson, killed, 5 officers wounded, 57 other ranks killed, 7 missing, and 69 wounded. o Erected by RICHARD H. ARROLL in memory of his elder son WALTER ARROLL L.L.B born 13th March 1877 died 2nd May 1906 also RICHARD HUBBARD ARROLL younger son of RICHARD H. ARROLL who died of wounds received on active service 24th August 1917 also RICHARD H. ARROLL who died on 13th August 1939 also ANNIE WALKER McLAY wife of RICHARD H. ARROLL who died on 14th July 1942. War Diaries: 5th Seaforth Highlanders. WO95/2866/1. National Archives. ARRAS:12 May 1917: Bt takes over right subsector of front line system trenches from 10th Inf. Bde. during the night 12/13/5/17 - Line runs roughly I19v66 - W of ROEUX Cemetery - I19d 4.9. - E of ROEUX - I19v60. A patrol advanced during darkness and established posts on road running N & S ? ROEUX. During the day front Coys captured 2 prisoners. 13 May 1917: Two platoons of 5 S.H. holding extreme right of Bde. front advanced at 10 pm & secured E end of ROEUX and posts were established on either side of ROEUX - PLOUVAIN RD. Hostile barrage was put down at 10pm but ?? quietened down at 11.15pm. One officer wounded Lt T.R. RUTHERFORD. 22 OR wounded. 2 prisoners captured. 14 May 1917: Enemy send lachrymating shells during early morning - Intermittent shelling in our sector during the day. 2/Lt EADIE J killed 20 K [sic] killed 30 OR wounded. 15 May 1917: At 8.30 am enemy bombarded our sector with ? fire from 1 hours which lasted until next day. 16 May 1917: Hostile bombardment lasted until 3.30 am when enemy put down an ? barrage and attacked. At this time Bde was in process of being relieved by 6th GORDON HRS. who became involved in enemy attack. At 8.30 am counterattack began and enemy were driven back. ROEUX was again held by British troops with the exception of the eastern end. Posts were established as on 12/5/17 on the road running north & south through ROEUX. Details - separate sheet attached. Bde relieved at dusk by 4th Seaforth Hrs. 5 officers wounded; Capt J. GUNN, 2/Lt R.F. SINCLAIR, 2/Lt MACINTOSH, Capt GILFILLAN RAMC, 2/Lt SIMPSON. 97 OR wounded; 37 OR killed; 7 OR missing.